We’ve already seen how diverse the Asian American demographic is ethnically, culturally, and linguistically; in a similar fashion, Asian Americans are very diverse religiously and spiritually as well. The religious affiliations of Asian Americans spans a wide spectrum, as implied by the title of the Pew Center report, Asian Americans: A Mosaic of Faiths. While there’s much in the report about many other religions, this chapter will focus on an overview of Asian American Christianity. The report cited that the overall survey results say that 42% of Asian Americans self-identify as Christian, that is, 22% Protestant and 19% Catholic. Note that these survey results also indicate that 75% of the U.S. general public self-identify as Christians. When I charted the each Asian American ethnic group with its Christian proportion, some new insights can be discovered. Take a look at the numbers across ethnic lines, and you’ll notice something very different for each ethnic group. As the chart illustrates, the most churched are Filipino Americans and Korean Americans, with a majority of Filipino Americans being Catholic while a majority of Korean Americans being Protestant. These proportions generally reflect the religious composition of each group’s country of origin. The Philippines, for example, is heavily Catholic. In some cases, however, the percentage of Christians among Asian-American subgroups is much higher than in their ancestral lands. For example, 31% of the Chinese Americans surveyed are Christian; the vast majority, though not all, of this group come from mainland China, where Christians generally are estimated to constitute about 5% of the total population. Similarly, 18% of Indian Americans identify as Christian, though only about 3% of India’s total population is estimated to be Christian. The higher percentages of Christians are a result of the disproportionate number of Christians who choose to migrate to the United States and may also reflect religious switching by immigrants. Notice the phenomena for almost every Asian ethnic group to have a much higher percentage of Christians in America than in their corresponding Asian country of origin. This could be attributed to being in a country where Christianity has had a stronger influence historically and the evangelistic zeal that is characteristic of American Christianity. I’ve also heard this tendency as being an indicator that Asians in America being more receptive to the Gospel. When people relocate to a new country, that disruption is a huge opportunity for changes in many areas, including one’s spirituality and religious affiliation. It should also be noted that most (if not all) ethnic Asian churches are very intentional at providing practical ministries and services to the Asian immigrants. These good deeds open the hearts of immigrants to the Good News too. What does all of this mean? First a couple of caveats to keep in mind. There are distinctly unique narratives and timelines for when each Asian ethnic group immigrated to the United States. This affects each group’s rate of assimilation into American culture, particularly for the next generations. These statistics are useful as a point of reference that shows a big picture of Asian American Christians like an impressionistic painting with broad paintbrushes. And we can see the different Asian ethnicities’ response to the Gospel and the difference between Asians in America versus Asians in America. Please do not use these statistics as a detailed road map or as a photograph to recognize individual faces. There are many many differences for each Asian ethnicity just as there are many differences between individuals too. In other words, use these statistics to get some basic understanding about different Asian ethnicities but don’t overgeneralize or use these statistics against people by stereotyping. You have learned a little bit more, not a lot, and definitely not everything. To have some knowledge is better than ignorance. As Christians come to faith, they also come together and organize into churches. These churches provide the tangible expression of their Christian faith that is particularly meaningful for Asian Americans and their cultural value for group-oriented cohesion. This estimate of 7,854 Asian American ethnic churches includes over 4,200 Korean and over 1,600 Chinese churches. While exact numbers of Asian American churches, (or even American churches for that matter,) are difficult to obtain, having estimates does provide some data for strategizing ministry. It’s reasonable to guess that a majority of these ethnic churches have worship services only in their respective Asian language, with a minority of them also having an English ministry, by necessity of ministering to the children of the immigrant families. However, these estimates for the total number of Protestant ethnic Asian churches just don’t add up for me. An average church is usually under 100 in size, so 7,800 ethnic churches would reach around 780,000 people. That is far short of 4 million people that would be part of Protestant churches, if indeed 22% of Asian Americans are Protestant as surveys indicated. This could mean a number of things: Asians, like other non-Asians, default their religious affiliation to Christianity; I’d say it’s unlikely that so many Asian Americans are attending non-Asian or multi-ethnic churches or thousands of ethnic Asian churches are unaccounted for. 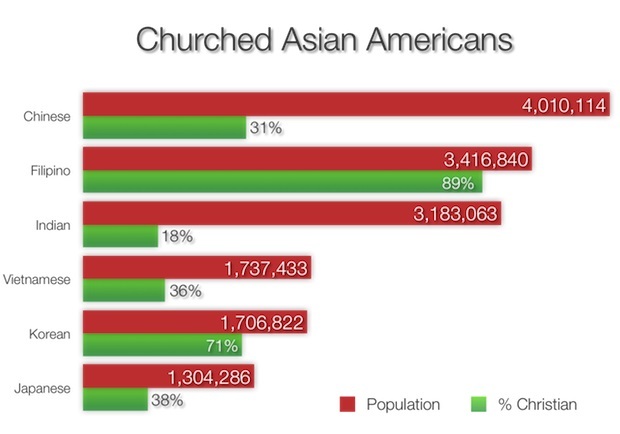 What this does say is: we need a lot more churches to reach this fastest-growing demographic of Asian Americans. In the next chapter, I’ll describe the common models of Asian American churches and how church governance is structured and organized for effective ministry. The data on the number of churches of each ethnicity is eye opening. Wow, only 4 Thai churches? And I never even given thought of an Asian Indian Church, shame on me. I think the numbers towards the end of the chapter could use some further analysis to help draw some of these conclusions. For example how many Asian-Americans are first generation immigrants vs. later generations? I would think later generations are much more likely to attend multi-ethnic churches as they either don’t understand or feel comfortable in native language based ministries or even their English ministry counterparts. Is it conceivable that there indeed are many Asian-Americans who don’t attend a historically Asian-American church, but do a multi-ethnic church? The two most recent churches I’ve attended would bear out some of this anecdotally as the second and third, etc. generation Asian-Americans have increased in number and influence at these churches. Though I have no way of supporting this assertion, there needs to more data to support the ones made in the latter part of chapter too. There may very well be an unexplained gap between Asian American church attendance and Asian American profession of Christian faith, a gap that likely exists outside of the AA heritage as well I would surmise, but a clearer picture could help cement the foundational argument that my guess the rest of this book is based on which is that we need more Asian American churches beyond just the basic need for more churches in general to reach the unreached.